What would you do when the one person your told by your elders not to commune with is actually the one to whom you are attracted to? That definitely complicates matters don't you think? So without wait let's see how they do it in The Clann #1 Crave by Melissa Darnell. Savannah Colbert has never known why she's so hated by the kids of the Clann. Nor can she deny her instinct to get close to Clann golden boy Tristan Coleman. Especially when she recovers from a strange illness and the attraction becomes nearly irresistible. It's as if he's a magnet, pulling her gaze, her thoughts, even her dreams. Her family has warned her to have nothing to do with him, or any members of the Clann. But when Tristan is suddenly everywhere she goes, Savannah fears she's destined to fail. For years, Tristan has been forbidden to even speak to Savannah Colbert. Then Savannah disappears from school for a week and comes back…different, and suddenly he can't stay away. Boys seem intoxicated just from looking at her. His own family becomes stricter than ever. And Tristan has to fight his own urge to protect her, to be near her no matter the consequences…. First book of the series and this is how it goes like. The Clann, the founding families of Jacksonville have strictly warned warned their younger descendants to have next to no contact with Savannah Colbert, but a certain younger descendant, Tristan Coleman can't seem to avoid her even if he tried. Even in a crowded hallway neither Tristan nor Savannah can ignore each other at all, even if they tried. Then there is the question of what the Clann really is and why don't they want their children mixing with the Colbert girl. Its easy they are witches and warlocks and who would be their enemy? Well the vampires. Savannah belongs to the vampire sect of the story (of what kind? that you need to read to find out...but thank God she doesn't sparkle....sorry couldn't resist). But when Tristan and Savannah start to get closer again (they used to be friends when they were kids) and realize their love for each other all hell breaks loose and the tentative peace treaty between the Clann and the Council is on tenterhooks. 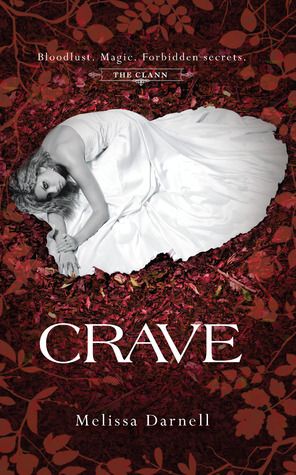 Crave is the first book of the Clann series and saying that it did take me a little while to get into it, like it does for me everytime I start reading something new but i was easily drawn into its chasms and relish every moment in it, all the cravings, joy, saddness, loneliness, love and affection and everything the characters feel within these pages. The plot can be considered fairly close to that of the classic pair Romeo & Juliet (pardon me but they are not really my favourite...too many inconsistencies for my liking) but they thankfully are not like them and rather grounded in the reality and supernaturality of the situation. Savannah really tries to stay away from Tristan and ignore him but situations in her life make it very hard to do that. She is an easy person to love and her transition from the one being bullied to the one learning to look after herself is very nice to see. Tristan is the typical southern boy who we easily fall for, he is strong and handsome and rather very much of a 'knight in shinning armor'. The plot on the whole was fairly something very familiar, you'll find a paranormal romance like this in many stories but what makes it unique is the setting of the plot and the way it is presented to us, altering between Savannah and Tristan's point of views. As well as the level of intensity of the love they share strives to melt even the coldest of hearts. I'm definitely looking to read the next book...what about you guys? I started reading this and lost interest...now I'm thinking I should have stuck with it :( Glad you liked it!! !